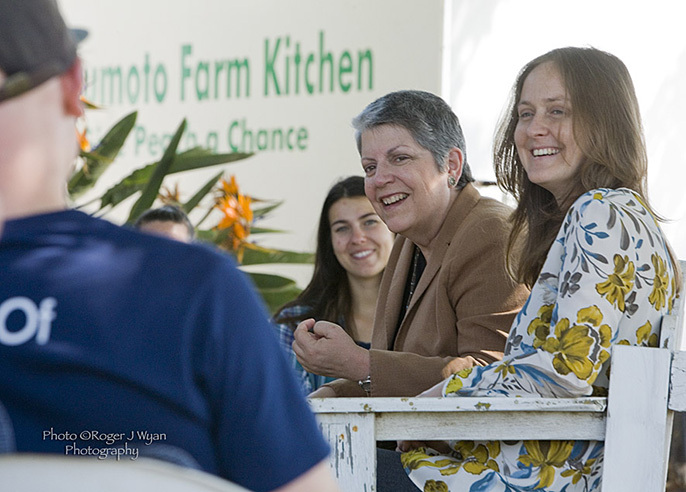 UC President Janet Napolitano listens to UC Global Food Initiative student fellows discuss their projects at Masumoto Family Farm in Del Rey. For 28 UC Global Food Initiative student fellows, their classroom Monday wasn’t a lecture hall or laboratory, but the sandy soils of Masumoto Family Farm near Fresno. The fellows, representing each UC campus, gathered at the 80-acre organic farm to dig into the soil, thin the fruiting peach trees and sit under a sycamore tree to discuss the food initiative with UC President Janet Napolitano. UC Merced undergraduate student Hoaithi Dang, who is working to develop food education as part of a freshman core course next year, called the visit invigorating. “I feel so inspired to continue my work and do more,” Dang said. Napolitano listened to the students talk about their projects, asked them questions and announced that she was extending the Global Food Initiative student fellowship program, which began last fall, for another two years. Napolitano, together with UC's 10 chancellors, launched the Global Food Initiative in July in an effort to help put UC's campuses, the state and world on a pathway to sustainably and nutritiously feed themselves. It’s an important subject to the fellows, who offered several suggestions for building the fellowship program and the broader initiative. UC Riverside graduate student Dietlinde Heilmayr suggested that fellows should meet at the beginning of the year to set goals, share ideas and develop collaborations. “We should think about having a workshop with food fellows and associated faculty in the fall to discuss projects and timelines and develop peer-to-peer relationships,” Napolitano replied, receiving thumbs up and nods of approval from the fellows. Ian Davies, a UCLA undergraduate student who is working to add two community gardens at the campus, said it would be good to know more about other fellows’ projects earlier, which could encourage joint efforts. “I think that would be really fruitful,” said Davies, who plans to visit gardens at each UC campus and compile that information for sharing. Having a digital archive such as a wiki also would be useful for fellows to share best practices, said Ankita Raturi, a UC Irvine graduate student who is working to model the environmental impact of agricultural systems. Global Food Initiative student fellows dig in the dirt with Mas Masumoto at his family farm near Fresno. The farm visit helped connect the fellows with each other and the land. The father-and-daughter team of Mas and Nikiko Masumoto, both UC Berkeley graduates, led fellows on a tour of their family farm, where they grow peaches, nectarines and grapes for raisins. “The key is the soil,” said Mas Masumoto, a third-generation Japanese-American farmer and author of books including “Epitaph for a Peach,” where he tells the story of his efforts to rescue the sweet and juicy variety of Sun Crest peaches. Standing in an orchard of those now 50-year-old Sun Crest peach trees, Masumoto asked the students to dig into the soil with a shovel, put their hands into dirt and feel how it crumbles into sand. Nikiko Masumoto taught the students how to thin peach trees — removing unneeded fruit from each limb, including small ones and “twins,” or double peaches, to make room for the strongest pieces of fruit, which will begin to be harvested in five weeks. Pinching off the immature fruit between their thumbs and index fingers, students called it therapeutic. From farm to fork, fellow projects are trying to make the food system more nutritious and sustainable. Kripa Akila Jagannathan, a UC Berkeley graduate student, is working with Lawrence Berkeley National Laboratory to make climate models that are more useful for farmers. UC San Diego undergraduate students Jancy Benavides and Jane Kang are doing research to advance urban agriculture at Ocean View Growing Grounds. The former vacant lot is now a thriving community garden thanks to a partnership between the local community and UC San Diego. Jonathan Schor, an M.D./Ph.D. candidate at UC San Francisco, is developing a mobile app that takes nutritional facts such as a food’s calorie count and translates that into an equivalent physical activity such as running or lifting weights. UC Santa Barbara undergraduate students Kathryn Parkinson and Emilie Wood are working to reduce food waste in UCSB’s dining commons — testing two messages to see which is more effective with students. They hope to spread their efforts across UC. Joanna Ory, a UC Santa Cruz graduate student whose project focuses on food equity but also is doing international research on water pollution from pesticides, asked Napolitano how she will make the global part more prominent in the Global Food Initiative. It’s important for students to build their understanding of agriculture by seeing firsthand how farming works, said UC Regent Fred Ruiz, who joined fellows on the farm visit. Before the tour, fellows gathered Sunday evening to meet the Masumotos and discuss student engagement. UCOP Sustainability Director Matthew St. Clair spoke about how as a UC Berkeley graduate student, in 2003, he helped lead efforts to get the UC Regents to adopt a systemwide green building policy and clean energy standard. St. Clair was then hired by UCOP to implement the sustainability policy, which has expanded to nine sections, including foodservice, and become a model for other universities.